Auckland Castle is closed for major renovation works, the Zurbaráns are out on loan, Kynren is due to return, but all roads led to BATH (Bishop Auckland Town Hall) for a lunchtime gig. 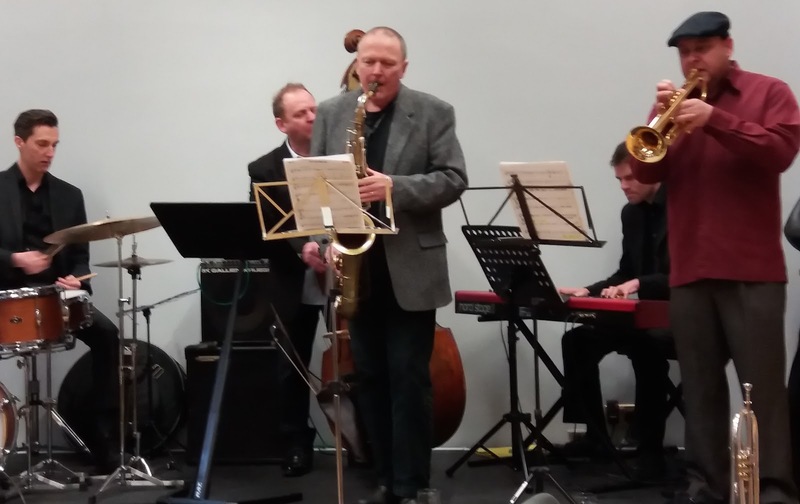 Mick Shoulder assembled a starry quintet to play the music of one of the great bands…the Jazz Messengers. The truth is, and Mick would readily acknowledge the fact, we were there to hear Lewis Watson. Where he’s been is anyone’s guess and one question remained to be answered…could he still cut it? Could he? Silly question! Mick’s band (Watson, Graham Hardy, Dean Stockdale and Russ Morgan) hit the ground running as our long lost tenor man tore into McCoy Tyner’s arrangement of That Old Black Magic. It’d been a while, but Watson has lost nothing; full-toned, majestic, turbo-charged, the command that comes from being the best around. If that had been it, just the one number, then the journey from Tyneside would have been worth it. But, there was more, much more! Lewis Watson’s frontline partner, trumpeter Graham Hardy has, of late, been heard tearing it up himself at a couple of terrific jam sessions. And on this opening number, Hardy didn’t baulk at the prospect of following Watson. Wayne Shorter’s Back Stage Sally maintained the head-shaking disbelief of some in the audience; first Hardy, then Watson blowing torrents, and, in the tradition of the modernists, the horns stepped off stage to allow the trio to stretch out. And what a trio! You’d happily pay good money to hear the piano, bass and drums line-up of Dean Stockdale (piano), Mick Shoulder (double bass) and Russ Morgan (drums). More terrific tenor playing from Watson on Nica’s Dream with Hardy taking a long, lung-busting solo…quite some front line! A couple from Benny Golson – Are You Real? with Hardy just about taking the honours and a Russ Morgan solo to boot, then Whisper Not (Hardy switching to flugelhorn on this one) featuring further superb tenor playing from Watson. All good things come to an end with bandleader Mick Shoulder making no apology for closing a magical one-hour lunchtime set with Tubby Hayes’ arrangement of Cheek to Cheek. Think ‘turbo-charged’ and you’ll get some idea of how this one went. Tubbs would change gear at will, similarly, Simon Spillett is a present-day exponent of the art, it’s time to add the name Lewis Watson to the select list of fearless, commanding tenor saxophonists. Lew Watson - the Man! Haven't seen him for years, but by the sound of this review still the tenor player's tenor player!